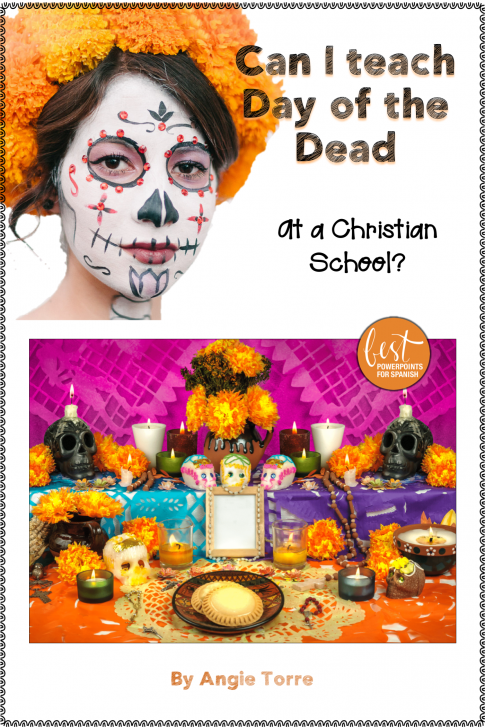 Can I teach Day of the Dead at a Christian School? Can I teach about the Day of the Dead at a Christian school? Hmmm. Skeletons, dead people, painted faces, altars, and an association with Halloween, which many Christians consider to be a pagan holiday. I always steered away from teaching it, but many dedicated Christians do, so I thought I’d better investigate what the celebration was really about. Not being a native speaker and lacking a deep knowledge of the Latin American and Spanish cultures, I decided to interview native speakers from different countries to find answers. I wanted to know if the practice of the Day of the Dead conflicted with Christian beliefs. Various countries observe the holiday in unique ways and with differing beliefs. For example, in Mexico, it is celebrated to a greater degree than in other countries, with parties, parades, costumes, decorated altars, and gravesite visitations. However, in other countries, it is recognized quietly with a simple mass to honor and/or remember loved ones. In Mexico, many originally believed that their dead loved ones returned to partake in the offerings that were given to them by their family and friends. Even though many no longer believe the dead come back to visit, they still participate in the holiday in order to commemorate their loved ones. In other countries, there is no such belief, just a desire to demonstrate love and respect for the deceased family members and loved ones. They believe that the loved ones return in our minds and hearts. So…. Can I teach about the Day of the Dead at a Christian School? Show the videos of the interviews of Eduardo (from Mexico), Eduardo, (from Colombia), and Teresa (from Equatorial Guinea) in which they talk about how the celebration is practiced in their countries and whether it does or doesn’t conflict with their Christian beliefs. (Hint, it DOES conflict with the beliefs of Eduardo, the Columbian.) Then, ask the students whether THEY believe the practice of the Day of the Dead conflicts with their beliefs and why. I should stop saying that in the next post we will be discussing tal y tal because I keep veering off the topic. Let’s say, next time we will return to our previously programmed topic of how to get students to speak the target language outside the classroom. Unless I get sidetracked again. In any case…stay tuned! If you would like more freebies and teaching tips to arrive in your email, make sure to sign up for my monthly newsletter and receive a FREE 122-slide PowerPoint on Spanish infinitives and regular verbs: Best PowerPoints for Spanish and French Scroll to the bottom to subscribe. I just taught about Day of the Dead at my Christian school today! The former Spanish teacher always stayed away from teaching it, but i believe it’s important for these kids to truly understand the holiday. And to make those connections to the Christian perspective about it! 🙂 so funny that I saw this post right after teaching it and getting uneasy feedback. It ended up being one of the best biblically integrated lessons that I’ve taught this year. Hi, Taylor: I’m so glad you had a good lesson and you could relate to the post about teaching Day of the Dead. Turns out many teachers had conflicts and parent complaints so the post was timely.